Cookbooks tend to fall into one of two categories. 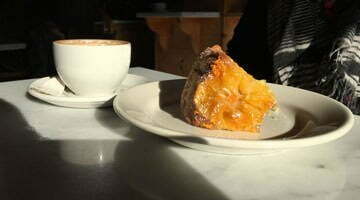 The first is the coffee table variety – pretty to look at and read, but not all that practical. French Laundry cookbook, I’m looking at you – not many people are going to spend two days making a Caesar salad. On the other side are the more frequently used practical books; the ones that are typically splattered with food after a few years. My preconceived notion of the just-released Le Pigeon – Cooking at the Dirty Bird, fell along coffee table lines; I expected lots of pretty recipes for things I wouldn’t be likely to try at home. Instead, I’m finding myself marking many of them for future use. This is not to impugn the design or photography. The images by David Reamer are beautiful, and the layout and overall content make this an easy cookbook to sit down and read from cover to cover. 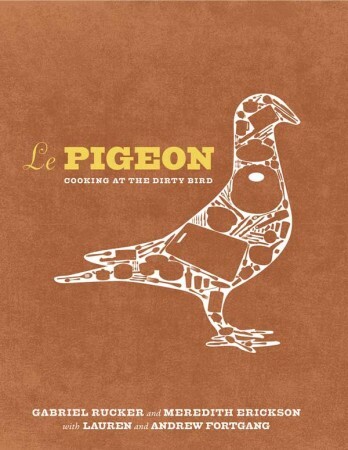 Le Pigeon – Cooking at the Dirty Bird is a collaboration, written over two years by chef Gabriel Rucker and Meredith Erickson, with pastry chef Lauren Fortgang and front of the house manager Andrew Fortgang. 342 pages long, it is separated into 125 recipes over twelve chapters: “Lettuce and Such”, “Tongue”, “Fat Liver”, “Little Birds”, “Rabbit”, “Small Fish Dishes”, “Big Fish Dishes”, “Pork”, “Horns and Antlers”, “Lamb”, “Veg” and “Desserts”. Interspersed you’ll find sections the on the background of Rucker and how the restaurant came to be, a love letter from Gabriel to the Plymouth Valiant (yes, the car), a wine section by Andrew Fortgang, a few pages about “The Weird and Wonderful World of Lars Norgren” who provides foraged ingredients such as mushrooms and wild nettles, and an essay from Steve Jones of the Cheese Bar – including his ideal cheese case. If you are a regular at the restaurant, you’ll recognize many of the recipes, such as Dirty Potato Salad, Le Pigeon Caesar, Grilled Lamb’s Tongue, Toasted Foie Gras and Jelly, Simple Roasted Pigeon, Quail with Pine Nut Risotto, Carrot Butter-Poached Halibut, and Beef Cheeks Bourguignon. Even the infamous Honey Bacon Apricot Cornbread and accompanying Maple Ice Cream are covered. Each one is carefully detailed, with suggested sources for hard to find ingredients, and step by step drawings for more complicated tasks such as trussing meat. Admittedly, many of these recipes will be off-putting to some people. 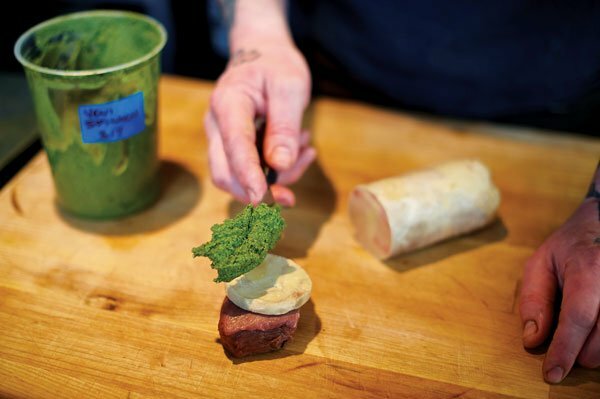 Not everyone will want to make “Elk Tongue Stroganoff” or “Rabbit and Eel Terrine”, but there are plenty that will satisfy just about any cook. I am not, by nature, an effusive person, but permit me an exception in this case. Cooking at the Dirty Bird is a wonderful book. From the layout to the photos and the recipes that Le Pigeon regulars will find familiar, there isn’t anything I would change. This is a book that will occupy scarce space on the low shelf in my kitchen, ready to be opened when I need inspiration. You’ll find the recipes and photos from the book for Butter Lettuce, Lemon Confit, Grapes, Spiced Brioche here, and Jacked Pork Chops here. Category: Authors / Book Reviews, Food Writing. Related posts about Le Pigeon Restaurant. More about Gabriel Rucker. I recently viewed a your recipe of the”Quail and Pine Nut recipe .i read this recipe Ina magazine I subscribe to called Grays sporting Journal. The recipe was incorrect. The had one pound of pine nuts a did not mention the amount of Risotto. Could you please clairify this please.